Its been a long time since my last post (over a year!) So I decided its time for a new one, and a new framework! Phaser is a new-ish HTML5 framework by Richard Davey that specializes in game development for HTML5. 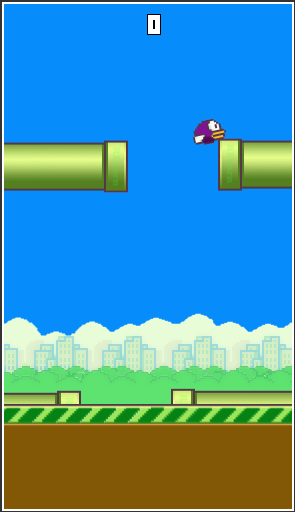 Following the excellent tutorial for making a Flappy Bird game, I made a kind of remix where you have to dodge pipes that are moving upward rather than to the right. You can play the game by clicking this link! The whole tutorial forces you to get used to node.js, which really helps with organization and workflow but was kind of hard to learn how to use at first. I’ve also been looking into porting this to mobile, but there are some hiccups. The game runs mostly fine in the web browser but for some reason, I can’t get sounds to play on my remix or the original tutorial version. Also debugging for Android browsers is kind of a hassle.